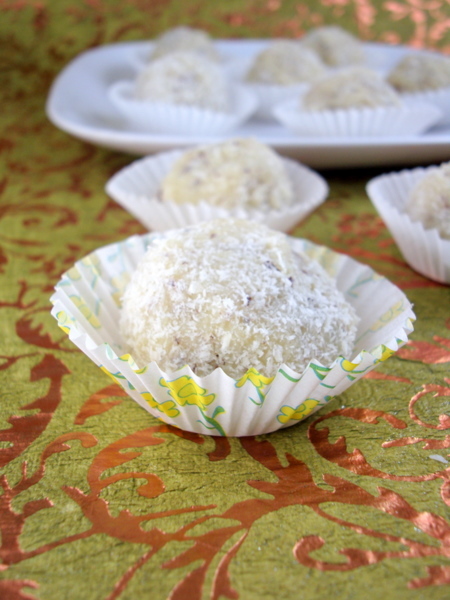 Coconut Ladoo is one of my favorite coconut dessert recipe to date. Just a few ingredients, a few minutes in the kitchen and you are ready for a heavenly experience with soft-on-bite rich coconut sweet. 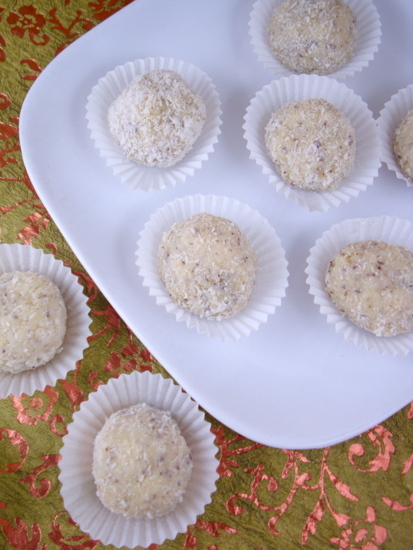 Coconut Laddu make for perfect after meal nibbles or a party dessert. Coconut works beautifully in sweetened condensed milk. You can also make excellent chocolate truffles with it substituting the cream. 1 Heat 1/2 tbsp butter or ghee in a heavy bottomed vessel. 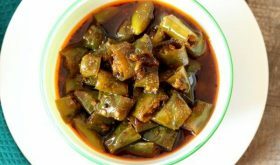 Add grated fresh coconut and saute for 4 mts on low flame. 2 Add 1/2 cup dairy whitener and a tin of condensed milk and keep stirring constantly (on low flame) till it leaves the sides of the vessel, approx 8-10 mts. 3 Add 1/2 tsp cardamom powder and mix. Turn off heat and cool. Grease you hand, make small coconut ladoo balls and roll in dessicated coconut. 4 Store the coconut ladoo balls iin an air tight container and place in fridge for longer shelf life. At room temperature it stays fresh up to 2-3 days. :You can add roasted nuts and dry fruits to the coconut ladoo if you want. What is milk whitener? Is there any substitute for that? Dairy whitener is basically a mixture of skimmed milk powder and sugar. I used Nestle Brand. You will find it at stores like More, Spencer’s, Food World. This dessert looks very yummy. I would love to try it but I havent heard of diary milk whitener here in US. Could we use a milk powder or could you suggest something different. Your recipes turn out great everytime. Wish I could also present it as well as you do. hi…just a doubt…can I use milk instead of dairy whitener. If yes, what would be the quantity? I wouldn’t suggest milk. Skimmed milk powder or milk powder will work. Its amazing how you come up with these extra delicious recipes!!!!!!!!!!!!!!!! where will we get this whitener and condensed milk in vizag? At Spencer’s and Karachiwala. Ask for Nestle brand. is regular coffee creamer okay to use instead of milk whitener? Can i give away with the dessicated coconut? 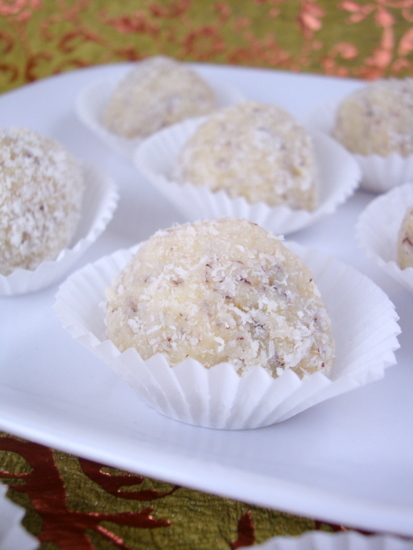 Hi Sailu, Have you used medium dessicated coconut or finely dessicated coconut for making the ladoos ? I used fine dessicated coconut. You can use either of them. I Followed the recipe exactly …the ladoos were tasty but too soft….more like kalakand….can you please advice how to fix it the next time I make it. hello, does the recipe call for fresh grated coconut or dried? And if it is dried, should it be fine or medium? thank you. Can you please tell me what dairy milk whitener is? I have never heard of that before. Thank you. Its high quality, high fat content milk powder.